I went into our local bookshop (Waterstones) the other day in search of books for my grandson, who is six, and enthusiastically learning to read by himself. He's at that crossover stage, where he still enjoys picture books, but is starting to need more text - while still needing the stimulation of interesting pictures. The first three or four shelves had books from reading schemes. Many of them looked great - but I have no idea what books his school has (he lives in Brussels) so was wary of choosing any of these. Then there were lots and lots of little paperbacks, often series, which, to be honest, all looked quite similar. There were cute animals, witches, lots of pirates, little superheroes, and naughty little boys. Many of them are probably excellent stories, and who knows? They might have fitted the bill perfectly. It's a detective story with (faint) echoes of Raymond Chandler. Mr Penguin is, indeed, a penguin. (One who can't swim and doesn't like the cold.) He has set up as a Professional Adventurer, and all he needs is for the phone to ring 'and for there to be a jolly exciting Adventure on the other end'. If this doesn't happen, he will quickly run out of money (why are private investigators always extremely short of cash?) and be obliged to pack his battered suitcase and hop on the first boat 'back to the Frozen South'. Fortunately, the phone does ring. It's Boudicca Bones, the owner of the Museum of Extraordinary Objects. She tells him that she, too, is short of cash - but she happens to know that somewhere in the museum, an ancestor hid a stash of treasure, and she needs his help to find it. So, with his sidekick Colin - a bowler hatted spider with very little conversation but a nice line in karate kicks - off he goes, and a riotous adventure ensues with a jolly good twist at the end. It's funny and fast-moving and beautifully produced - and I think my grandson will love it. Will report back! 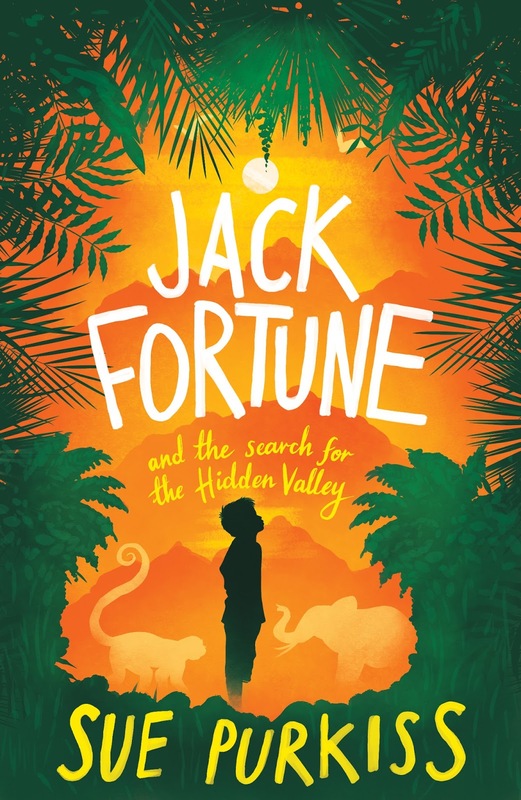 Sue Purkiss's latest book is Jack Fortune and the Search for the Hidden Valley, which is about plant hunting in the Himalayas and also has an orange and green cover, as you can see. It sounds great fun, Sue - I'm sure your grandson will love it! Great choice and one that will be fun to read. Thanks for the review, Sue.